Smithills Hall is a Grade I listed manor house, and a scheduled monument in Smithills, Bolton, Greater Manchester, England. It stands on the slopes of the West Pennine Moors above Bolton at a height of 500 feet, three miles north west of the town centre. It occupies a defensive site near the Astley and Raveden Brooks. 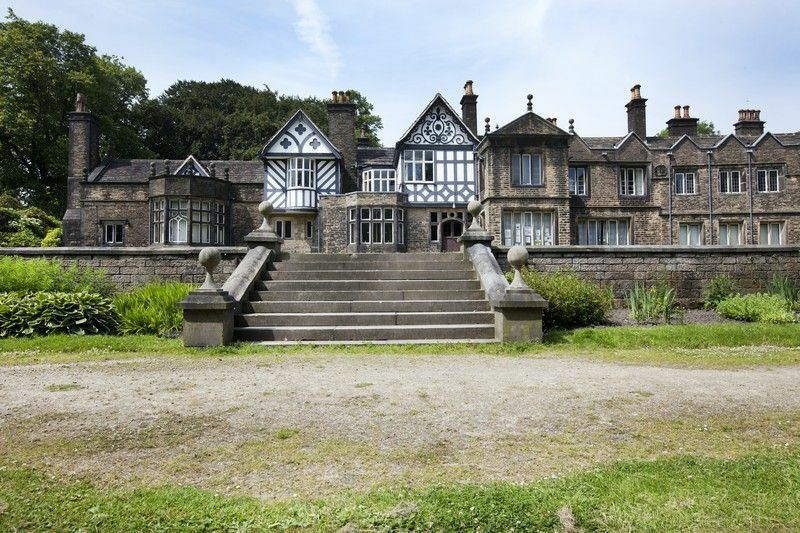 One of the oldest manor houses in the north west of England, its oldest parts, including the great hall, date from the 15th century and it has been since been altered and extended particularly the west part. Parts of it were moated. The property is owned by Bolton Metropolitan Borough Council and open to the public. The name Smithills derives from the Old English smeþe meaning smooth and hyll, a hill and was recorded as Smythell in 1322. Early medieval records about the hall began in 1335 when William Radcliffe acquired the manor from the Hultons who held it from the Knights Hospitaller. On Radcliffe's death in 1369 it passed to his son and heir Sir Ralph Radcliffe, High Sheriff of Lancashire for 1384–1387 and twice MP for Lancashire. The Radciffes lived there until 1485, when the male line failed and Smithills Hall passed to the Bartons, wealthy sheep farmers who lived there for nearly 200 years. In 1659 the hall and estate passed by marriage to the Belasyse family. In 1722 the Byroms of Manchester bought the manor and kept it until 1801 when the hall and estate were acquired by the Ainsworths, who made their fortune as the owners of bleachworks at Barrow Bridge. Around 1875 Richard Henry Ainsworth employed architect George Devey to extend and modernise the hall. In 1938 the Ainsworths sold the hall to Bolton Corporation. Parts of it became a residential home and day centre that closed in the 1990s. The oldest parts of the hall opened as a museum in 1963, and in the 1990s, the museum was extended into some of the Victorian extensions. The west wing was restored by the council in 1999. In 1554 George Marsh, a preacher from Deane near Bolton, was 'examined' at Smithills Hall, before being sent to Chester to be tried for heresy. He was found guilty and executed at Boughton in Chester. A footprint, supposedly left by Marsh, is said to bleed every year on the anniversary of his death (24th April). Nathaniel Hawthorne visited and described the hall when he was United States consul in Liverpool in 1855. Smithills Hall is built on a formal terrace, surrounded on all sides by parkland on the south side of a steep-sided valley formed a tributary of the Raveden Brook. The hall has three ranges around an open court. The oldest part of the structure is the great hall in the north range which was probably built in the early-14th century and once was surrounded by a moat. It has been altered but retains its original plan and medieval features. The oldest parts were built with timber frames and the oldest stonework is roughly coursed rubblestone. The 19th-century west wing is built in coursed, squared stone and has decorative timber framing. All the roofs are covered in stone flags. Park and gardens. The 48-hectare (120-acre) gardens and pleasure grounds are on south facing sloping land on the edge of moorland with a steep wooded valley and lake to the north and formal gardens around the hall. 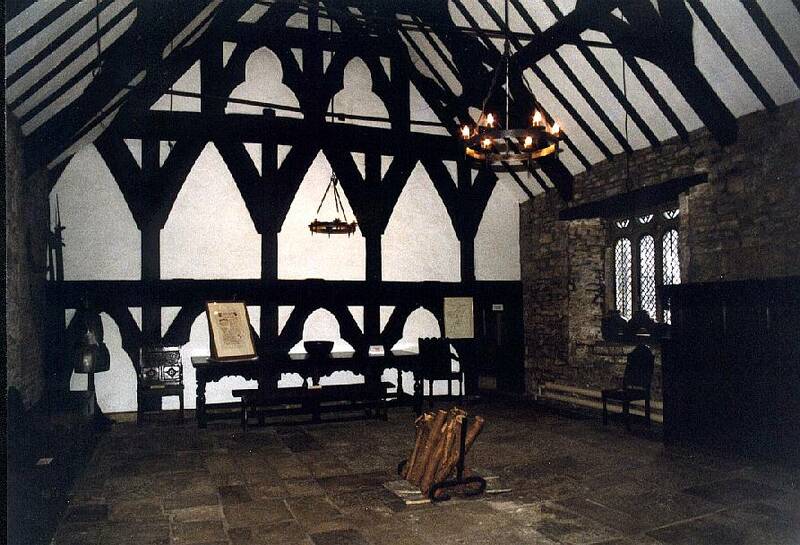 Great Hall: Although this impressive medieval manorial hall has been altered, repaired and restored over the years, it still retains its basic original shape and many medieval features. Bower & Solar Rooms: These two rooms were created in the early 1400s to provide private quarters for the Radcliffe family and accordingly have a more intimate, domestic feel than the grand and spacious medieval hall. Withdrawing Room: The withdrawing room was built by Andrew Barton between 1520 and 1540. The Chapel: There is evidence for a chapel on or near this site for centuries. In the 1950s, human bones were found under the floor of the withdrawing room, perhaps part of a cemetery attached to the chapel in the early medieval period. George Marsh's footprint: On the floor at the entrance to the withdrawing room is a mark on the stone floor (now protected by a glass plate). Legend has it that this is the footprint of Bolton farmer George Marsh, a victim of the persecution of Protestants during the reign of Queen Mary. Colonel Ainsworth's Room: This section of Smithills Hall was part of the early 16th century extension built by Robert Barton and was originally divided into two rooms. Mrs Ainsworth's Room: This room was also originally part of the extension added by Robert Barton in the 16th century. The Library: A library was an essential accessory for the Victorian landed gentry and was stocked with volumes chosen to show off the owner’s education and interests. Situated outside of the town centre in the Smithills area of Bolton, the Hall is one of the region’s finest historic houses. The building is accessed via a front door with ramped access. The galleries are based mainly on one level but with two rooms on the first floor accessed via a staircase. The Hall is an accredited museum and they are a member of the Visitor Attraction Quality Assurance Scheme. •The nearest train station is Bolton, which is 3.27 miles away. Taxis are available at the station. •The nearest bus service is the 527 which leaves from Bolton Town Centre. •The road leading up to the Hall is paved on one side and is tarmac. Car Parking and Arrival. There is a car park directly outside the Hall with designated disabled parking. There is a further car park situated further up the lane from the Hall. Visitors can be dropped off at the entrance. •There are permanent ramps from the main entrance to the reception area. •The reception desk is on the ground floor. •The floor surface within the Hall is a mixture of tiles, wood, stone and carpet. •There is a lowered section of the welcome desk. •A magnifying glass, pen and pad of paper are available on request. •The museum is on two floors, with the majority of rooms being on the ground floor. •Due to the age of the building the floors in many areas are uneven. •There are various steps up and down into some of the ground floor rooms. A ramp is available on request. •There are 2 rooms on the first floor accessible via a staircase. Photographs of these rooms are available at the bottom of the stairs for those unable to access this floor. •Some of the rooms have interpretation boards with pictures and large text. •Library and Museum assistants are on hand to offer any assistance. •There are chairs available to use throughout the building. •Lighting in the galleries is generally bright and evenly lit; however some areas are more dimly lit to aid preservation of the collections. •Public toilets including an accessible unisex toilet are located on the ground floor. •The unisex accessible toilets can be unlocked with a RADAR key available from any member of staff. •There are baby changing facilities on the ground floor. •There is a shop with a range of souvenirs and books etc. which can be accessed on the ground floor of the Hall. •The shop is level throughout and is large enough for a wheelchair or pushchair. •A low level counter is provided. •There are tall display racks and low levels ones accessible from a seated position. •Staff can offer assistance if required. •There is a privately managed Tearoom within the hall serving a variety of hot and cold food and drinks. •Tables and chairs are provided. •The café is waitress service. •All their staff receive regular training that includes disability awareness training. •They have a set of evacuation procedures – should you require it someone will assist you with evacuation. •They welcome trained assistance dogs. A water bowl is available on request. For out-of-hours (see below) enquiries call their Ask Bolton Libraries enquiry team on 01204 332853 . Transport: Bolton (National Rail) then taxi or bus. Bus routes 525, 526 and 527 from Bolton Town Centre stop nearby.